Weleda 2 in1 Gentle Shampoo + Body Wash gently cleanses and cares for delicate hair and skin. One of the best all natural shampoo/ body wash for babies. My daughter has alot of hair, this made her locks shiny and free of tangles. The light scent is very soothing. I refuse to use anything else on her, the best products are usually from Europe. Not overly scented. Works for all 3 children. Cleared up dry scalp after the first wash. Makes hair soft and manageable. does a great job, not overly scented. My favourite shampoo/body wash Iâ€™ve tried on my toddler. Absolutely love this and always have it on hand. One of the best products on the market. The hair is very clean and silky after washing with Weleda shampoo. It has a very pleasant smell of Calendula. My daughter has been using it since she was a baby for more then 10 years now. I wish it wasn't that expensive. You may not need a lot of it for a baby but the bottle doesn't last on long hair. The Weleda shampoo & body wash is a winner here. Itâ€™s very creamy and suds up well. My baby is extremely sensitive to scents and other chemicals. We can hardly use anything on her. This product has not caused any reactions and leaves her hair Soft and clean. This is a very good product and I will definitely buy it again. A beautiful baby wash, have used it consistent with 3 kids and still using it with my almost 5 year old. Gentle scent, not drying, and you don't need to use a lot at a time so we find the bottle lasts a while. A sweet subtle calendula smell. Not drying, perfect for baby skin. No tears. Phenomenal body wash for adults too! Love it. Glad I found it at well.ca! Love Weleda products and this is no exception. Doesn't irritate my baby's eczema. I love the scent and feel of this product. Sometimes when the baby is sleeping, I'll sneak some for my own shower lol it's the bomb!! Completely changed my 2 year old's skin! We had been using Burt's Bees since she was a baby, but over the past few months her back was getting more easily irritated and dry. We thought her back was sensitive to clothing tags rubbing on her. Turns out it was the Burt's Bees. Now that we use Weleda, her skin is sooo silky smooth. Natural, not toxic, reassured to wash baby with that. Love this body wash. Smooth and silky. Doesnâ€™t dry out babyâ€™s skin and I use quite often to wash babyâ€™s bottom at most diaper changes. Bottle design makes it easy to use use with one hand. Love how Weleda products are all natural with a ZERO toxicity level on the ThinkDirty Ap....a true green product! the only soap i use on my my babies! I've used this on both my babies. Perfect for newborn and infant hair and skin. Very gentle product and leaves a nice scent that does take over the babies natural smell. Lovely smell! Very gentle on little one's skin and doesn't dry it out like many other "baby" products. I have been using this on my daughter since she was born. She is 9 years old now. Love it! Love Weleda Calendula products! This body wash is silky and doesn't dry out my baby's skin. It smells very good, the smell is very light and doesn't stay on the skin after the bath, which is especially great for a newborn. Love love love this shampoo. The calendula is really great - my son hates the smell of any other shampoo we've tried. 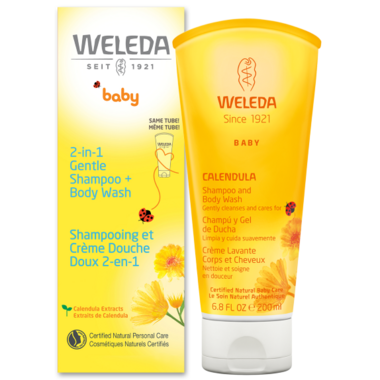 I love Weleda products and I find Calendula shampoo very gentle to my baby's sensitive skin. Her hair is always soft and it doesn't dry her skin. This is great shampoo for sure for babies and children. Really love this products. It's not as foamy as other shampoos, means doesn't run all over the place. You only need very little like the size of a 5ct coin or you would need more water to wet your hair better. It gives nice smelling and clean hair. Using it for many years now. the only baby wash we use. Best baby wash by far! Does not dry babies skin smells great! The best baby wash for little ones with sensitive skin. We have tried every brand out there and the Weleda is the best! I have been using this body wash/shampoo on my daughter for the past 9 years. It's all I have used, that's how much we love it! Perfect and most natural baby product I found. The only thing I wish it had was a pump dispenser because I miss that feature from the brand we used before. love this product. have used it on our kids since they were born, never any problems. light scent. Is there anything that Weleda makes that it's not good? Simply amazing! When my son has a deep rash this cream was the only solution to our problems. Love it! I am very happy with this product. I am using it for my new born baby. I mix this with water and coconut oil for homemade wipes solution (on washcloths). Cleans great, no overwhelming scents and gentle on baby's skin. The only baby wash I use! It is gentle but cleans well without over drying the skin. It also smells amazing, a very natural fragrance. Love this product! Smell is mild, my little one's skin accepted this with no issues. Only thing I would change is to offer a pump bottle option to make it easier to dispense during bath time. We love this product! My youngest child has extremely sensitive skin and this product is very gentle on her skin. It is very thick so you only need a small amount to get you little one all clean. I highly recommend it to anyone looking for a great product to use on sensitive skin. As a body wash it's great. I use it on my one month old baby and I use it for myself too! But as a shampoo I am not crazy about it. My baby has cradle cap and this shampoo stuck to the dead skin so there was a layer of white on her scalp! Needless to say, not an ideal shampoo for cradle cap!!!! I use this both for my baby and myself! Very gentle and has a nice mild natural scent. I really love Weleda baby products. I have been using this for my kids for 4 years and I love it. It smells good without being perfumy, it leaves their skin very soft. No redness and no itching. I've been using weleda products on my daughter since she was a baby, and I am still using this shampoo and body wash on her, and she's now 5. I love the smell, it rinses nicely and it doesn't irritate her skin. Works great and I love the smell. She smells fresh and clean and it's nice to know it's a product that's healthy and safe for her, too. I have already ordered some for our baby on the way! I was given this as a gift when my first baby was born and have been using it ever since. I love the smell and it works. Nice to know I'm not putting tons of chemicals and perfumes on my baby's delicate skin. I mix this baby wash with water and coconut oil to make baby wipe solution for my wash cloths. Great product. Works great for my daughter's sensitive skin. I love the smell too. I have fallen in love with the WELEDA products. This wash is no exception. I had quite a few different products gifted to me prior to having my new little one and this wash is now being used exclusively. It is super gentle, but cleans well. It also smells nice, but is not too strong and not perfumed. I will definitely purchase this again! I love the baby Weleda products, they are soft on baby's skin and are made with natural ingredients, they have a very relaxing scent for baby and I love that it's not too strong. I tried other organic products and ended up having to go back to this one cause it's so gentle on baby's skin. I love this product for my kids, it keeps there skin soft especially if you use the lotion after. I would recommend it.